Many elderly people dread the idea of having to leave the familiarity of their own homes where they are surrounded by the community, family, and friends. Beacon Support’s North Brisbane Home Care Services can play a part in helping you or your loved one to stay at home even when you are unable to cope on your own. For most, everyday activities become more difficult as they become older and frailer. They may lose their independence and many may feel embarrassed having to ask for help with personal hygiene and household support. We offer home care support that can range from a couple of hours per month to 24 hour assistance. 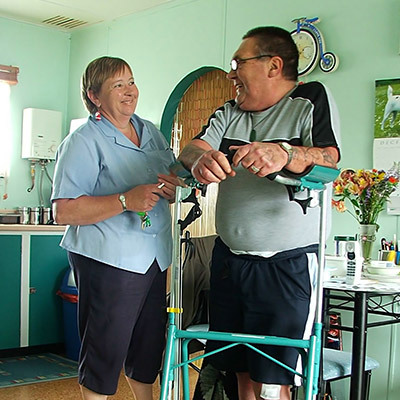 Not only do we care for the aged, our North Brisbane Home Support Services cover disabled care, rehabilitative care, palliative care and respite for carers. Each North Brisbane Home Care Services package that we deliver is tailor-made to your requirements. You choose. We deliver. The Australian government supports the notion that the elderly should be encouraged to stay at home. This is why they offer subsidies for in-home support. If you are over 65, and in some instances over 50, you may qualify for a Home Care Package. To inquire about eligibility, contact the Aged Care Assessment Team. They will assess your condition and assign you a level of care. There are four levels of home care package, ranging from basic care to high care. Each level carries with it a government subsidy. As of the 27 February 2017, the approved funding is placed directly into your account. In line with the consumer-driven approach to home care delivery, you have the right to decide who provides the service. You or your loved one is also responsible for choosing which services you require, when and in what quantity. You need not make the choices on your own. Beacon Support client management consultants can help you to make the choices that suit your budget, your goals, and your interests. Once discussions are complete we will supply you with a detailed support plan. This plan will contain agreed services, delivery quantities and timing. At the end of every month, you will receive a detailed statement of the funds received and the services delivered along with the costs. This cost transparency will help you to ensure that you remain within your budget. We will continue to discuss your ongoing needs with you, as we know that support and care requirements change over time. Our carers are carefully selected and trained. They offer one-on-one service that will make them an important part of your home. It is essential therefore that we allocate you a caring and diligent person who will develop a long-term relationship with you. If you require assistance contact us to find out more about our North Brisbane Home Support Services.